Jerry M. Reinsdorf was born on the 25th February 1936, in Brooklyn, New York City USA, of Jewish ancestry. He is a certified public accountant, lawyer and businessman, but best known for his ownship of the basketball team the Chicago Bulls (NBA) and the baseball team the Chicago White Sox (MLB). For his great contribution to basketball, Jerry Reinsdorf was inducted into the Naismith Memorial Basketball Hall of Fame in 2016. How much is the net worth of Jerry Reinsdorf? It has been estimated by sources that the overall size of his wealth is as much as $350 million, as of the data presented in mid-2016. The main sources of his wealth are basketball and baseball. To begin with, he was educated at Erasmus Hall High School, and then he graduated from George Washington University earning Bachelor’s degree; later, he graduated from Northwestern University School of Law in 1960. Initially, Reinsdorf pursued his career as a tax attorney working for the revenue service of the US federal government. Four years later in 1964, he decided to go into private practice, and Reinsdorf subsequently earned a fortune from real estate using tax shelters. He sold his business to Shearson Lehman Brothers in 1982, receiving $102 million. Prior to selling his business, in 1981 he purchased the franchise of the White Sox, paying $19 million. In 1983 the above mentioned baseball team set the best record in MLB, and in 2005, the team won the World Series – the last time it had won the title was in 1917. The owner of the team built a new stadium with the owner of ice-hockey team the Chicago Blackhawks, which was named United Center. The agreements for leasing spectator boxes, etc substantially boosted Reinhold’s net worth over many years. However, the baseball team is consistently successful, and retains its fan base. 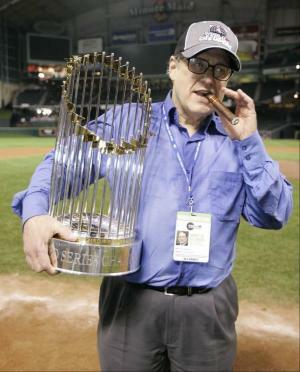 Reinsdorf is considered to be an influential personality in baseball, although he is way more influential in another sphere – basketball. In 1985, he became the chairman and the owner of the basketball team the Chicago Bulls. The team managed to win six NBA championships in the 1990’s, however, Jerry Reinsdorf encountered many controversies concerning not re-hiring such key figures as the professional star shooting guard Michael Jordan as well as the coach Phil Jackson. To add more, Reinsdorf initiated the rules that place a limit on the amount of money that a team is allowed to spend on player salaries, as well as the distribution of losses and profits among stakeholders. As a highly respected person, he was inducted into the Wisconsin Baseball Hall of Fame in 2006. For his philanthropic efforts Jerry Reinsdorf was awarded the Jefferson Award for Public Service in 2011. Additionally, he serves on the board of directors of Shearson Lehman Brothers, Inc., Equity Office Properties, LaSalle Bank, the Northwestern University Law School Alumni Association and other organizations. Furthermore, Jerry Reinsdorf in a partnership with John Kaites, David Aguilar, Dennis Burke, Mark Sullivan and Noah Kroloff has launched a business advisory and security consulting company, Global Security and Innovative Strategies. Finally, in the personal life of the businessman, he married Martyl F. Rifkin in 1956. They have four children Michael Andrew, Jonathan Milton, Susan Janeen and David Jason, but the latter passed away. Currently, Reinsdorf resides in Chicago, Illinois.